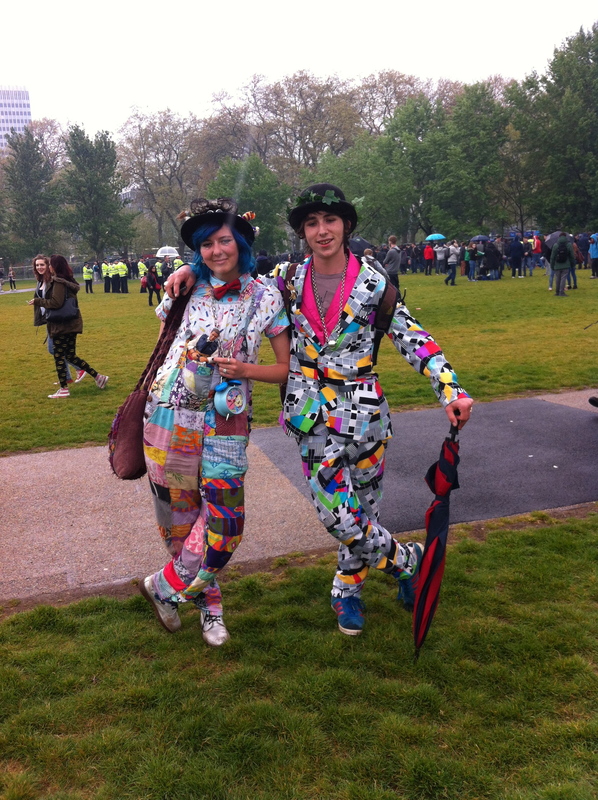 MoonProject – 420 Day 2014 at Hyde Park, London. 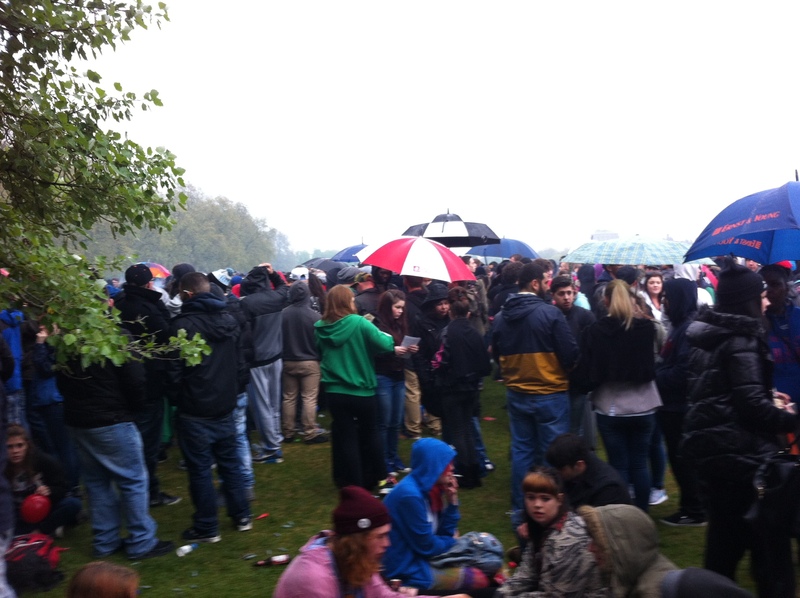 You are here: Home » Culture » 420 Day 2014 at Hyde Park, London. 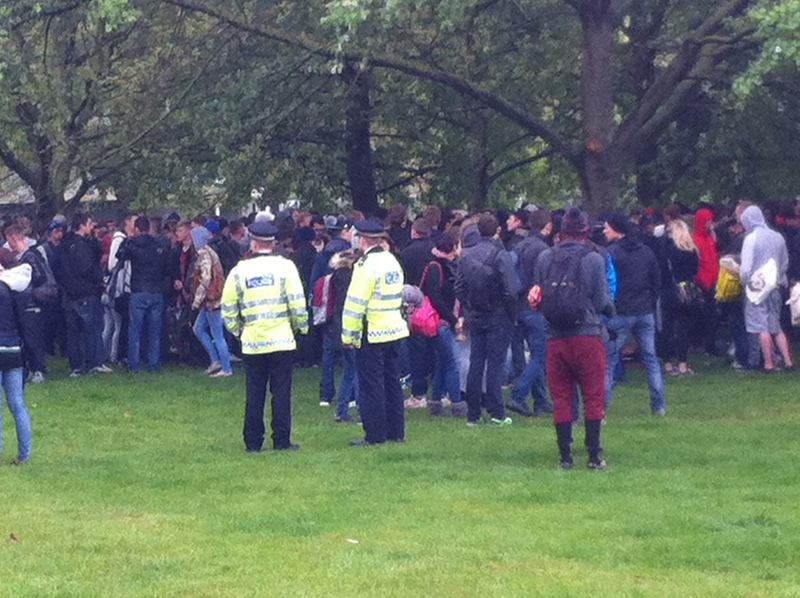 420 Day 2014 at Hyde Park, London. The day ended as it had begun, cold and wet. I had arrived at my local train station to find that I was nearly a whole hour early for the train I intended to catch. As I sat on the platform and waited, flicking impatiently through the various songs stored on my phone, I wondered what kind of turnout there would be today? 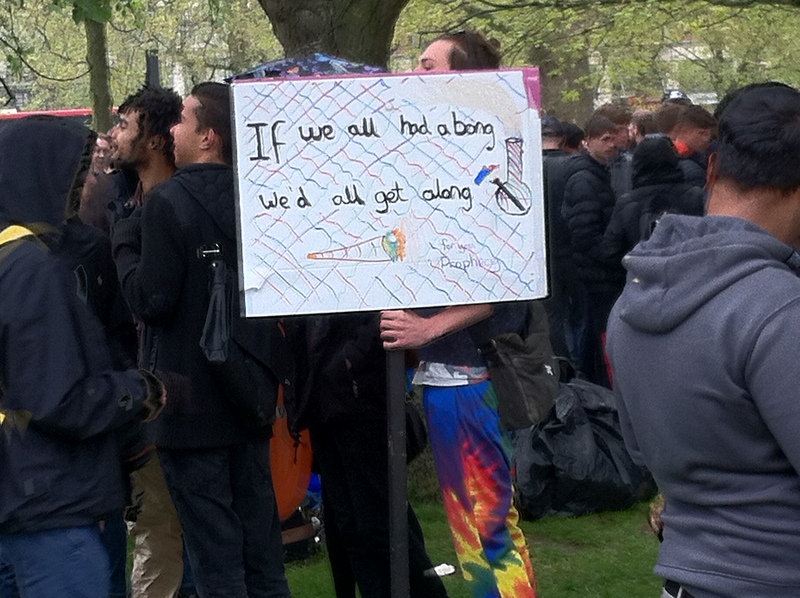 The weather hadn’t put me off, but could the same be said for the rest of those who had planned to attend the 420 day protest at Hyde Park? If I knew anything about your typical stoner it was that they’re not known for their love of being soaked through by precipitation. I suddenly remembered I hadn’t bought a ticket, the last time this happened I was stopped at the barrier in London Victoria by an overly aggressive ape-man and, after about 5 minutes of feeble excuses, was forced to buy one. 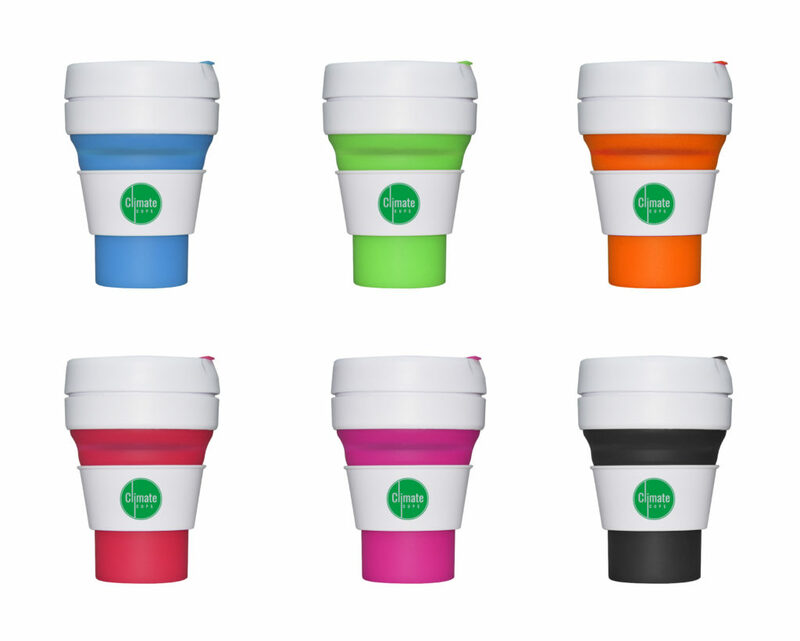 This was way down on my list of things I wanted to happen today and so I decided it would be best to grab one. The ticket machine had other ideas. OUT OF SERVICE was the message that greeted me and fierce flashbacks of the ape-man’s scowling face began to plague my mind. Eventually, the train appeared on the horizon and as I climbed aboard I debated whether buying a ticket was really what I wanted to do. Did I really want to throw away the money I had with me on a stupid piece of card that I would no doubt have thrown away by the time I was back home? Trains have become toys for the wealthy and I suspect I am not the only person to have ever had these thoughts. Said thoughts were, however, dashed when I remembered exactly where it was I was going. London Victoria was one of the largest train stations in the country and, unlike my local train station, you could not get in or out without a valid ticket or oyster card. This settled it, I would have to pay the price for living in such a remote area of the country and pay the ridiculous fare for a 40 minute journey into the capital. When I finally arrived at Marble Arch the rain had taken hold and for a brief moment the cool, wet breeze felt extremely refreshing in comparison to the unnaturally warm underground platform from which I had just emerged. But only for a moment. I soon resembled a drowned rat as i made my way out from underneath the shelter of the station and onto the saturated street. The nearest entrance to Hyde Park had been blocked off for some peculiar reason and I found myself having to circumnavigate the long wall before I reached an alternative entrance. 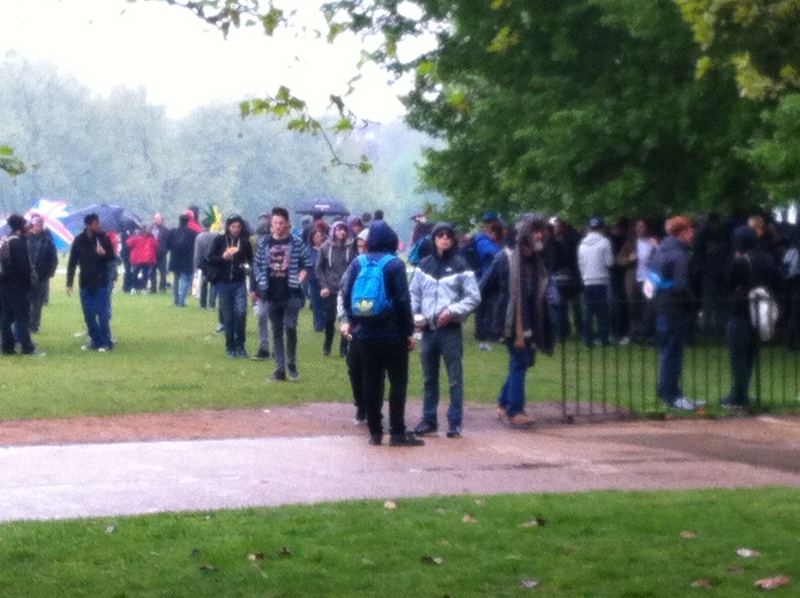 Walking past I got my first glimpse at Speakers Corner and the mass people that had congregated there. 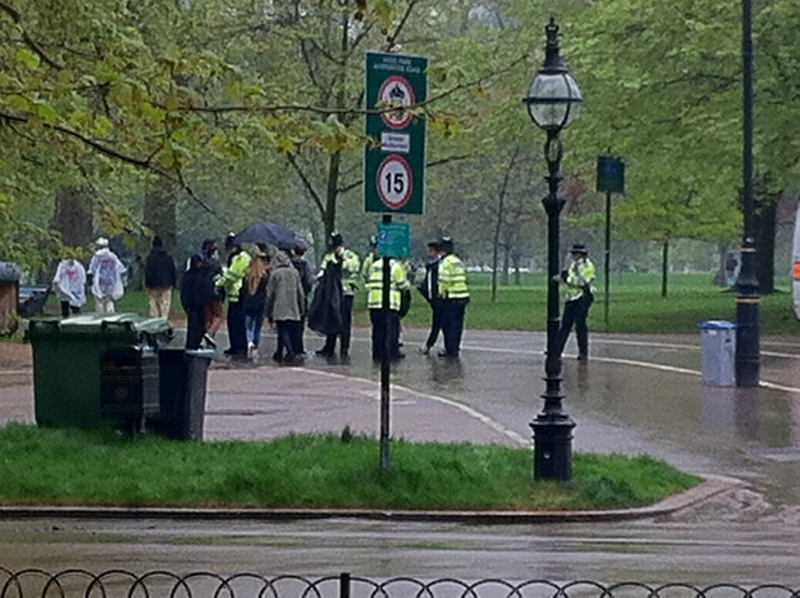 Instantly I noticed several groups of five or six police officers cordoning off several parts of the park. 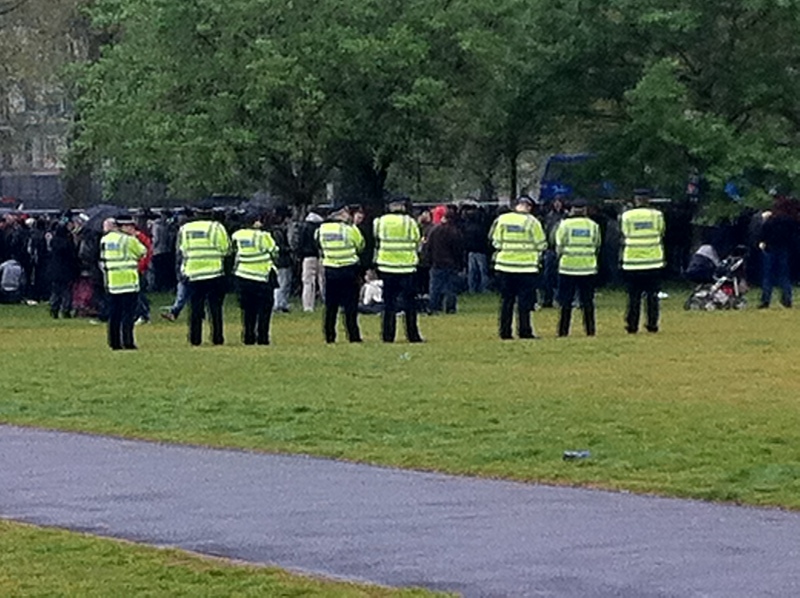 There was a much larger police presence than I had expected, I counted at least 15 at the blocked off entrance alone. Upon reaching the next entrance I was greeted by another cluster of police officers who appeared to be searching the bags and belongings of all who entered the park. I am not a fan of being searched, it has happened too many times now for anything other than feelings of exposure and guilt to flood my mind during the process. I decided to take a detour so as to bypass the prying officers and, to my surprise, I managed to get passed them without to much trouble. As I walked backed down towards Speakers Corner I began to notice a few ominous signs situated along the walkway towards where the protest was taking place. I remembered being present at last years event and seeing nothing of this sort, although, I was extremely high busy at the time and may have just not noticed them. I arrived at 420 base camp just in time to witness a young man being bundled into the back of one of the many riot vans that were parked in the area. I couldn’t tell why he was being arrested and the officer I asked told me in no uncertain terms that it was none of my business. I later learned from several other onlookers that he had been waving a placard around in a way that was apparently deemed aggressive by the arresting officer and when confronted about it subjected the officer with a torrent of abuse that ended with him being forcibly removed. The accuracy of this version of events cannot be confirmed. It was only when I reached ground zero that I realised just how many police men and women were present. They were quite literally the shepherds of this herd of people that had gathered to commit a unified act of civil disobedience. They stood in rows of six to eight and acted as barriers, manoeuvring the way a sheep dog herding sheep would in order to keep everyone exactly where they wanted them. This surprised me, I had expected the same tactic as the previous year, observation from a distance. But this was certainly not the case. 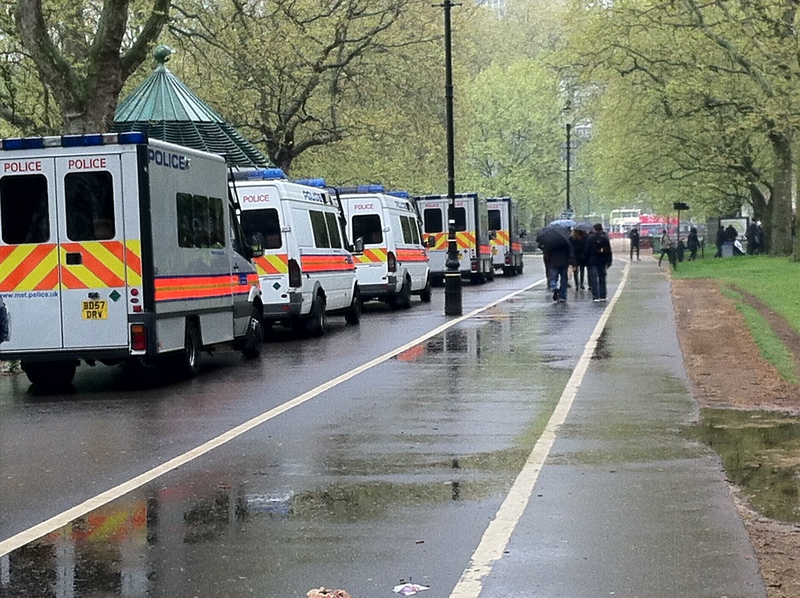 There were riot vans, police horses and what looked like two whole stations worth of officers ready to deal with whatever they felt needed dealing with. I found myself feeling slightly disappointed at this, why the aggressive assertion of authority? Why did they feel the need to beef up security to such a level? What could have possibly happened the last time to make the believe this was necessary? I couldn’t understand it. I decided I needed to find out what the cause of this could have been. I strolled around the mass of bodies in search of a policeman that had strayed from the pack. I wanted to get them alone and question them about the size of the police presence my idea being that they may be more inclined to talk to me without being under scrutiny from their fellow officers. However, this was no easy task. After what felt like an eternity searching, I managed to find two policeman standing relatively isolated from the rest of the pack. I had hoped for a single officer but seeing as this was what looked like my only option I decided to go for it. As I walked over to them they began to eye me up suspiciously, their faces scanning mine, searching for any kind of motivation as to why I would be heading their way. 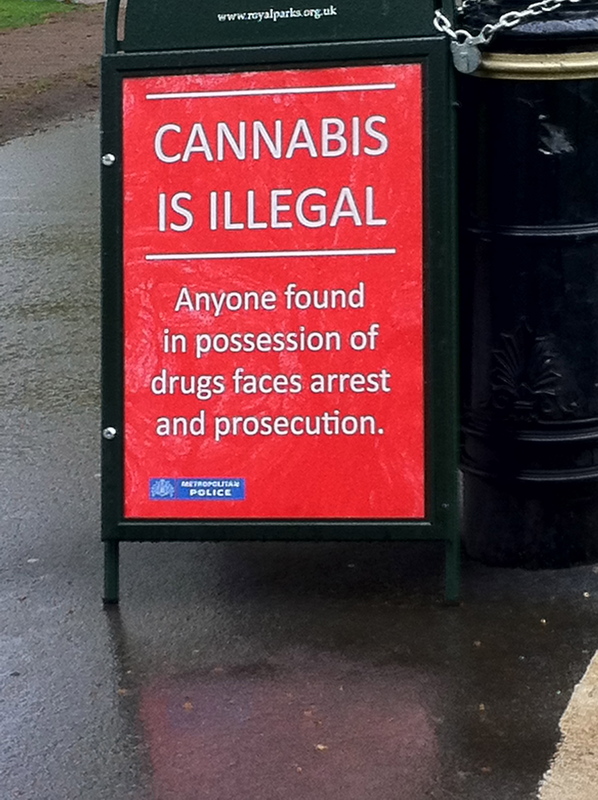 Was I one of the many stoners they surely must have come into contact with coming over to question why Cannabis was illegal? Could I be a concerned citizen fearing for my safety amongst this gaggle of dope fiends? Did I need assistance? As it turns out the policemen were actually two very nice blokes. They explained that, due to several stabbings at the event last year, the government had requested a much larger police presence this time around. We talked for several minutes about how the police could actually make things worse by increasing their numbers and how many people here had no animosity towards them until they began to feel overly surveilled. They were less inclined to give their own personal opinions on the protest and declined to answer any more of my questions after that but I’d heard what I wanted to hear from them anyway and so I bid them good day and went on my way. The rest of the day leading up to 4:20pm I spent talking to people and taking part in the day’s festivities. I spoke to many interesting people about a number of different things and every one of them left me feeling like I really needed to spend more time in these beautiful surroundings and just talk to people. It really is quite awesome to think that there are so many different people from so many different walks of life that can all come together one day for the same reason and just have a good time. I came across a couple that were dressed in what were possibly the best matching outfits I have ever seen. When the moment finally came there was a loud cheer and a chorus of lighters being flicked into life. For the second time in two years I found myself struggling to get a decent picture of the cloud of smoke that arose on that moment and for the second time in two years I failed in doing so. I’ve attached my attempts below as well as some other photos I took on the day. There was so much going on that day that I really couldn’t fit everything that happened into this article, however much I’d like to. I’ll leave you with this, getting onto the tube stoned was one of the funniest experiences of my life and I thoroughly recommend it.